Glendale Raptors shutdown the vaunted San Francisco Golden Gate offense consistently to claim Pacific Rugby Premiership championship title in the Kettle at Infinity yesterday. On a day when a pre-match cloudburst could have posed significant issue, high flying predators halfback Mose Timoteo provided impeccable service to his three-quarterline, enabling a quartet of groundings for Glendale’s outside backs led by a brace from fullback Max Statler. The Raptors speed to breakdown and method work done therein wore down their opposition and kept the XV from San Francisco in reactive mode while Coach Andre Snyman’s XV worked their well-established pattern to great effect. Spitting, though rain diminishing at the start and Glendale into the SFGG 22 early, maintaining a steady pounding from short, pick-and-goes back and across the somewhat slippery pitch; Statler himself cracked a crease from three meters out and touched down a try converted by inside center, Armandt Peens, and 7-nil for Glendale barely six minutes in. A spot of untoward liveliness at tackle caused field magistrate Derek Summers to halt time for a chat with the captains in the 13th minute; that settled, it was back to rugby for the house and all its cards. 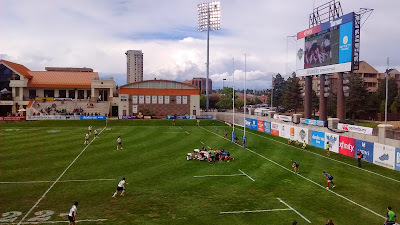 A low, driving aerial from the Glendale flyhalf Dan Fleming was knocked on in coverage and scrum for Raptors; won and spun, but ball forward at tackle reversed possession and San Francisco’s clearance didn’t find touch though forward pass negated the Glendale advantage and SFGG had the scrumput, midfield. Tight forward work now in the p-and-gs and a penalty for San Francisco as Raptors caught not releasing the tackled player at breakdown. SFGG #10, Volney Rouse, found touch eight meters from Glendale’s goal and lineout to San Francisco. Raptors poached the toss and cleared their lines, but soon found themselves on the wrong end of Summer’s whistle for not releasing ball at tackle, 12 meters from their own goaline. San Francisco opted for a shot at goal, Rouse split the sticks from 20 meters out inside the interior right hashmark, and 7-3 the score in the 26th minute. San Francisco crept closer on a second Rouse three-pointer after Raptors were pinged for not releasing the tackled player and 7-6 the numbers at minute 32. Another SFGG lineout toss swiped by Raptors 25 meters from glory, Timoteo’s swift service to his three-quarters and a perfect leading skip-pass by Peens to flyer Preston Bryant allowed for that #11’s grounding in the corner and 12-6 now for Glendale in the 37th minute, which is how things stood as Summer’s halftime signal had lads to lockers for the break. Raptors two trys to SFGG’s two penalty goals indicative of the flavor of the match: Glendale were able to shatter their opponent’s defensive scheme twice, while San Francisco were denied entrance to the holy ground and managed just the pair of Rouse penalty strikes. San Francisco roared out of the blocks after restart, and a headsup try from outside center, Samisone Pone, made it a one-point margin again at 12-11 in the 41st minute. Back came Glendale, and when San Francisco’s theft of a lineout toss was negated by an offside call, Peens punished with three from in front of the posts, just beyond the ten meter line: 15-11 for Glendale at minute 47. 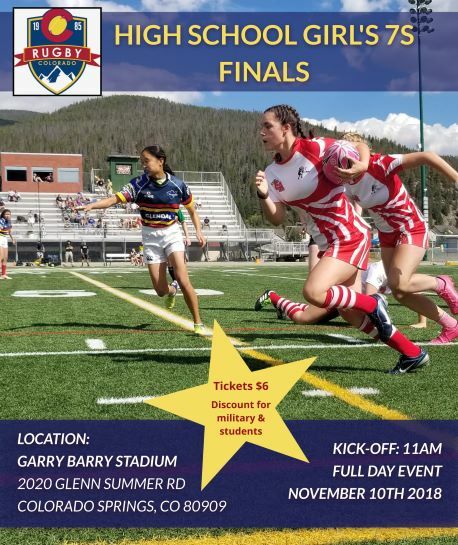 The wide-ranging, all-encompassing play on offense and defense from Glendale’s numbers 5 and 7 - lock Luke White and openside Christian Sarmento - impressively crucial to Raptors success in halting SFGG’s advances and turning the ball over at tackle with the Kettle on full boil. Industry by both sides between the 22s, but Raptors able to maintain forward momentum due their solid defense and turnover capability at the breakdown. Raptors claimed lineout ball at their ten meter line and Timoteo serviced his backline. Ball spun out wide saw wing, Dustin Croy, fly along touch and feed a hard-charging Statler in support; the Raptors fullback, banking a full head of steam, stepped inside an arm tackle en route to his touch down that put Glendale more than two scores ahead at 20-11 after 66 minutes of action. Glendale would get an insurance try as Bryant got his brace and the tallies told a 25-11 tale in the 69th minute. That’s how things stood at Summer’s last blast for a record of 25-11 and a new PRP champion in Glendale Raptors… and our Man of the Match award goes to Mose Timoteo for his masterful direction of the forwards in both the loose and sets, and rapid recycle to the backs all day long; Mr. Timoteo is now the only player with a pair of PRP Championship rings.